*Access iFit® account from computer, tablet, or smartphone. Requires membership, sold separately. Tablet not included. Tablet requires Android 5.0+ with Bluetooth 4.0+. iPad 3 and above with iOS 8+. A minimum of 600dpi screen width. When you step on the pedals of a ProForm® elliptical, you get instant access to professional training programs fully loaded and ready to go. Now you can enjoy a challenging workout focused on your goals. Plug in this wall adapter to power your console electrically if you prefer not to use batteries. We know you love the outdoors. That’s why we made incline training available on your elliptical. Now you can hike any mountain without leaving your living room. 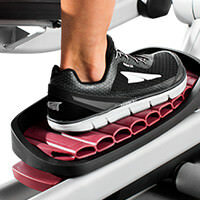 With a quick adjustment, this ramp adjusts your incline, allowing you to focus on specific muscle groups. Target your glutes, quads, and calves for realistic trail training. You’ll be 100 percent prepared for the next family hike. With 20 digital resistance levels, you can start out easy and progress to intense. Each level is smooth, frictionless, and silent with our patented SMR™ Silent Magnetic Resistance. 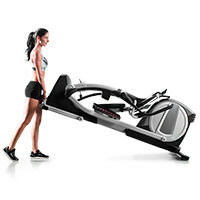 The ProForm® Smart Strider 695 CSE Elliptical is protected with a 5-Year Frame Warranty and 2-Year Parts and Labour Warranty. When this elliptical is fully assembled, the height by width by depth dimensions are 165 cm x 81 cm x 203 cm.